There are many different types of roses. 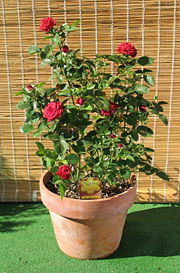 If you are new to rose gardening, then it is wise to choose varieties of easy to grow roses to begin your rose garden. Some roses require constant attention and caring for while others require none. Roses come in varieties of high maintenance to no maintenance. Most roses, though, do require a certain amount of time to get started and to care for adequately. Minimal care roses that produce maximum results are ideal for beginners or those still somewhat new to rose gardening. Not only will it teach you the basics without working you to death, it will also encourage your gardening experience, perhaps leading you to take on other rose types that are a little more challenging to care for. Easy to grow roses need some care as well. Some roses will exist solely based on their will to survive. There are many types of easy to grow roses that do not require watering or fertilizing but rather suffer nature independently and flourish. However, this type of treatment is not ideal for any type of rose and I do not recommend that you treat your roses in this manner no matter how much they seem to prevail. Instead, a good balance of watering and feeding is ideal because it provides the essential nutrients and elements that your plant needs without putting it under strain to get them for itself. Belinda’s dream is a good easy to grow rose. Belinda’s Dream is one of these very easy to grow roses. Belinda’s Dream grows approximately six feet high. Blooms are a beautiful, soft pink and they continue to bloom through the whole year. This rose is naturally disease and pest resistant and will absolutely flourish on it’s own with little care. You can also consider “Knockouts” for your rose garden. Knockouts are another one of these simple and easy to grow roses. Knockouts are very well liked and appreciated because of their ability to constantly bloom. Knockouts are also extremely hardy and resistant to disease and pests. They are adored by warm and humid climates such as the southeast because they are quite resistant to black spot, which is a disease that is dreaded by rose gardeners of any warm and humid atmosphere. The Knockout produces vivid red colored blooms and it creeps out and covers a wide area. Of all of the easy to grow roses, Knockouts offer you a wonderful turnout that is a winner for sure. Fairy Rose is also on of these easy to grow roses. Fairy Rose is also on of these easy to grow roses. It is what rose gardeners refer to as a dwarf rose which only grows to lengths of two to three feet. Do not let this name fool you, the Fairy Rose grows closely to the ground and blankets quite a bit of area. It also blooms magnificently throughout the year even through the harsh months of July and August. Beware of the monstrous thorns on this one. This is the one, and only deterrent I can think of to growing this one. The thorns make this plant a little more of a challenge to prune and care for but if you are willing to take it on, it can offer some eye-popping results during bloom. Overall, the Fairy Rose still has my thumbs up because of the over the top bloom power that it has. The butterfly rose is also a great pick. Mutablis (otherwise known as the butterfly rose) is my last pick of these easy to grow roses. It, like some of the others, blooms constantly throughout the year. The flowers change colors as they develop and this is a unique property that I have only observed in one other rose. The petals begin as a delicate yellow, turn to an orange color, then change to pink, and finally wind up a deep and vibrant red color. 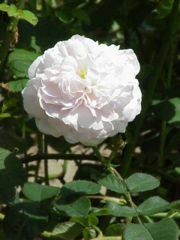 This rose is also resistant to disease and is definitely a very hardy grower. These are just a few of the roses that are easy to bloom and are therefore great starter roses for any rose garden. You offer yourself the opportunity to become familiar with roses and general terms and aspects of rose gardening without becoming heavily involved by choosing a rose that is simple and easy to grow to begin your garden with. As your skill and understanding of roses develops, you can then move onto bigger challenges by planting some of the more difficult to grow roses in your garden.